Give your creativity a boost. In my last post I shared some branding tips from Jo Malone, the other big thing I took away from her talk was the need to be constantly creative. This is such a good point but alas I think, from school onwards, experience stifles the creativity in many of us. We spend lots of time on left brained activities, analysing the works of famous poets for example instead of writing our own poetry. We pass exams on the basis of technique in preference to ideas and we rubbish creative thinking before we examine its merits. For the business owner there are all sorts of advantages to thinking creatively, finding new products or services, finding ways to use waste profitably (weren’t Mars bars and Post It notes the product of waste materials initially? ), finding ways to differentiate our businesses from the competition and to give our customers a Wow experience. So today I thought I’d share a couple of creative thinking techniques to try to give your creativity a boost. 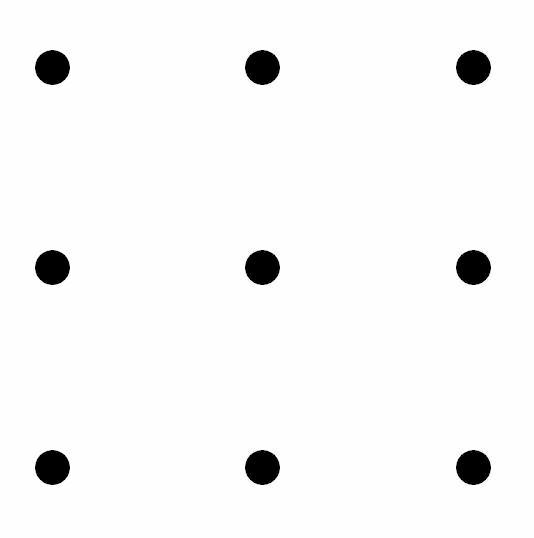 Join the dots with four straight lines and without taking your pencil off the paper. Hint: this is out of the box thinking! Read the following colours out loud, I mean the colour you see not the word you see! Did that shake your brain up a bit? How many other words can you make out of one word? How many new words can you make out of ‘Administration’? Note you can only use letters in the frequency that they appear in this word and your words must be in a dictionary. Why not share your list in the comments section? Feel free to use a different word if you prefer or to do this exercise in your own language. Time to apply some out of the box thinking to a work related problem. So now that you have stimulated your right brain a bit why not try to use it to solve a work related problem, What are you currently grappling with that you have yet to find a solution for? For example, what new products or services are you going to offer? Write down as many potential ideas as you can find. Don’t judge them. Look for the really wild ideas. Involve your team, your family, your football club or your network. Just generate ideas. Keep the list and leave it where people can add more ideas as they occur to them. I’ll have a couple more ideas for you in our next post and then we’ll think about how to develop the ideas into something you can use. If this exercise was useful you might like to join our 21st birthday 21 Day Make Money Challenge. We’ve reached day 10 already but you can start at day 1 or wait until we relaunch the challenge on October 21st. This entry was posted in Personal development, Small business advice and tagged Business, Creativity, Lateralization of brain function, Mars (chocolate bar), Post-it note, Thought, Waste by glendashawley. Bookmark the permalink.